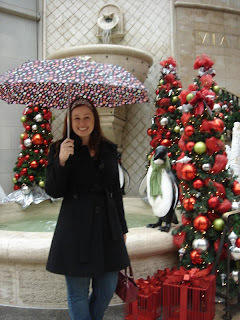 It's Holiday Season and I love it! I have my Christmas Tree up, my house is decorated inside and out and I am really getting into the Christmas spirit by baking. I made my Christmas cake 4 weeks ago and it is cuddled up in brown paper in the tin maturing beautifully. With the dried fruit left over from making my cake, I made fruit mince. Fruit mince is a mixture of dried fruits, such as sultanas, raisins, currants - basically the fruit that is used for a fruit cake or plum pudding. You can be flexible with the ingredients, adding whatever dried fruits you like or have on hand. I really like the addition of dried dates as they go kind of creamy when they cook down. I have my fruit soaking again in rum to make it plump and juicy. I am really getting my money's worth out of this duty free rum, even if I am only baking with it! The recipe is simple. 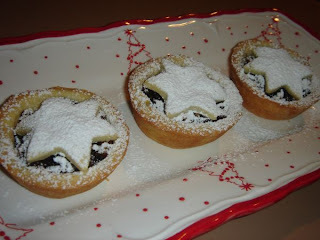 Remember that you can alter ingredients for the fruit mince to suit your own taste. For instance, if you don't like mixed peel, leave it out. Also, if you are avoiding alcohol you don't have to add rum or brandy, I like it because it adds depth of flavour to the fruit. Just experiment! I hope you love making them as much as I enjoy eating them! Mix all ingredients together and leave in the fridge for 1-7 days to macerate. Mix flour, almond meal and icing sugar together. Cube butter and add to flour mixing with fingertips until mixture resembles breadcrumbs. Add egg yolk and mix until combined. Roll into a ball and flatten slightly, wrap with cling film and rest in refrigerator for 30 mins. Preheat oven to 180 degrees. Roll out dough to a thickness of about 3mm. 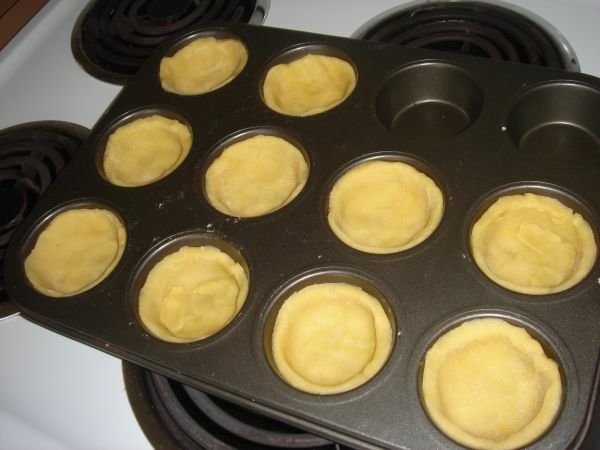 Using a round pastry cutter (or a glass), cut circles out of the dough (about 3 inches round) and line the bottoms of a muffin pan by gently pressing the dough into the pan to about 3/4 up the sides of each cup. (Be sure to save the scraps as you will roll out this leftover pastry to make your pie tops). 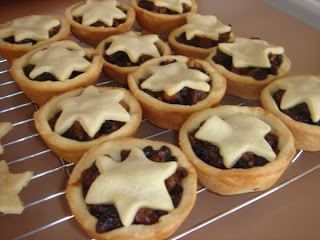 Spoon in your fruit mince mixture (about 1 tbs should be enough to fill each tart shell). 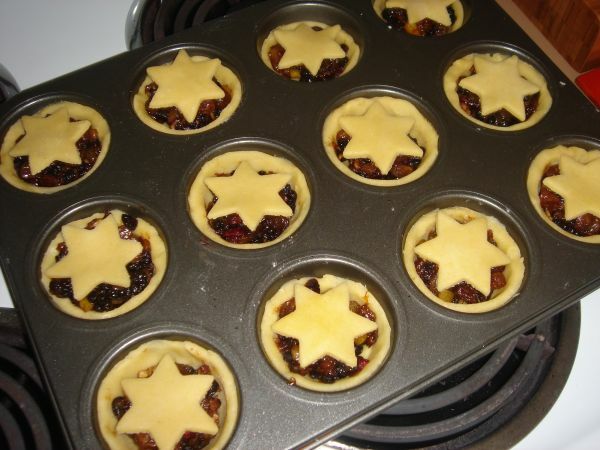 Roll out remaining pastry and either cut slightly smaller circles to make lids for you pies, or alteratively, use a cookie cutter to cut pastry shapes for the top of your pies. (I find this easier as you don't have to fuss about with sealing the lids and it looks cute). Bake in a moderate oven for 15-20 mins or until pastry is golden. 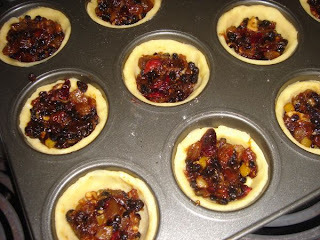 Remove from oven and let cool in the muffin pans for 5 mins before transferring to a wire rack to cool. A butter knife helps to ease them out of the muffin pans easily. Dust with icing sugar before serving if desired. I think these pies are just as good if not better than store bought. Plus it is always nice to be able to show off and say 'I made these myself'.